"Hutterites have always been farmers,” says Lone Pine Colony’s Peter Entz. “This is what we know." 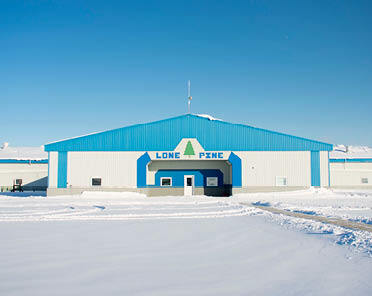 We’re in an unassuming office beside the barn, one of many blue-roofed buildings on a vast stretch of land about 20 kilometres northeast of Stettler, Alberta. Peter’s great grandfather was a Mennonite in Europe but later joined the Hutterites, who practice rural communal living. Farming is in Peter’s blood, and he’s passed on his knowledge to his son Tony, who now runs the barns for Lone Pine chicken. And Tony’s raising birds that are certified humane and antibiotic free. 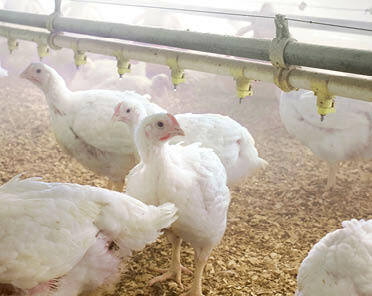 “We produce the original big chickens, like the ones you used to see growing up,” says Tony. Like his dad, Tony is wearing a plaid shirt and black suit and speaks with a very slight Germanic accent. The key to getting quality birds is to give them the room and time to grow naturally, Tony tells me. At Lone Pine, the free run chickens are raised a full seven to nine weeks, roaming around the pens eating and drinking anytime they want. Tony makes their feed with grains grown right on the farm and spends time daily checking that the feeders are full and the automatic watering system is working. It can freeze in winter, he explains, especially on days like today where the thermometer is down around minus 30 degrees. When it’s not freezing outside, usually from May to November, the birds are developed in outdoor pens, says Tony. In addition to the homegrown feed and plenty of space, Lone Pine’s certified humane chickens are given bales of hay to perch and display natural behaviours. As we head into the barn to meet the birds, Tony apologizes for the mess. I look around at the precisely placed ladders and brooms hung on the walls and realize he is referring to a wheelbarrow in the centre of the room filled with a neat stack of cardboard. It’s then that I really get a sense of how well-cared for these birds are. When I step into the pen to take photos there is no squawking or flapping, the birds are all exceptionally calm. Most pay me no attention, but a few strut over to pose for the camera. Before I leave, Tony shows me through their provincially inspected processing facility. There’s nothing going on today, but the sizeable room is waiting spotlessly. Chickens are only processed every two weeks, Tony says, then the fresh whole chickens and vacuum-sealed packs of wings, drumsticks and breasts are sent to our markets the next day. Try Lone Pine’s plump, premium chicken on Stockboy Special this month! 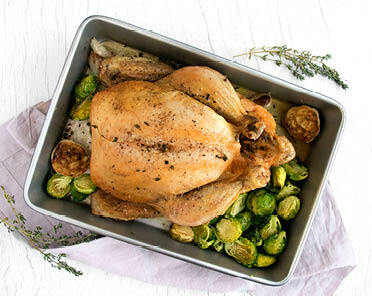 Check out our Lone Pine whole roasted chicken recipe.